Just a quick update on the state of my art studio. Canvas: blank. Brushes: dry. Personal goals of finishing a painting a month: *hangs head in shame*…. I would say the word “indecisive” sums up the past few months of my creative life. It’s like I opened the flood gates to the animal spirit world and they all want in, all at once! This leads me to the importance of focus. No, I’m not talking camera lenses (although I am increasingly aware of my need to purchase a camera that has fancy parts like f-stops.). Clearly, cameras are not part of my professional background, but part of growing as an artist involves non-stop learning. The real focus I need requires ME to put a priority on my studio time above all else. Sometimes I need to go within to find that focus, and sometimes I have to go out into the world to get it. Which leads me to today’s focus… another mysterious winged creature will make its way onto my canvas this weekend: RAVEN! 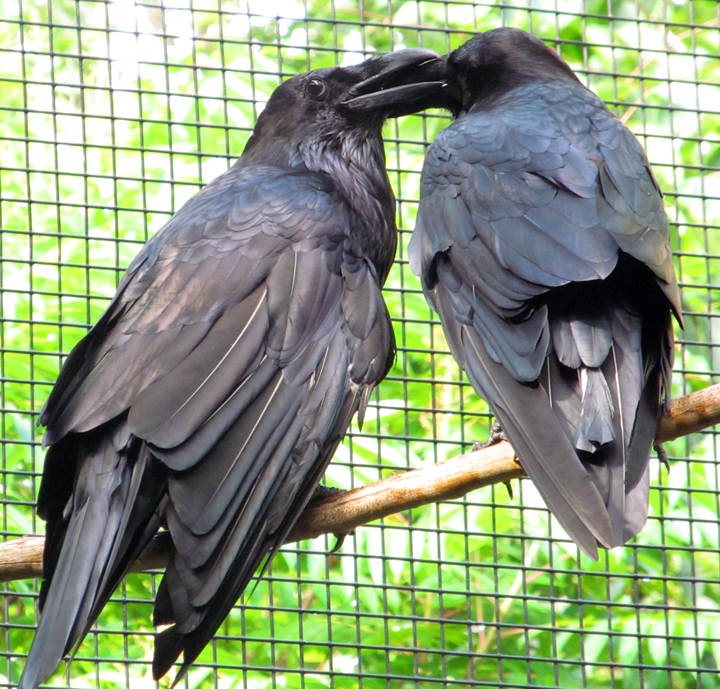 I spent the most time with a pair of Ravens, a male and female. As I was watching them, a thunderstorm was rolling in, and they were both visibly nervous. They were “quorking” and literally holding beaks. They stayed in this posture for minutes at a time. It was so clearly a comforting gesture. Much different than the foreboding qualities that are usually associated with these birds. If there is anything I want to accomplish in my paintings, it is creating a connection that breaks through our cultural labels of animals, and lets us see them as they really are. Beautiful and magical and ordinary, like us.